Signe's Bakery Cafe is very cozy. 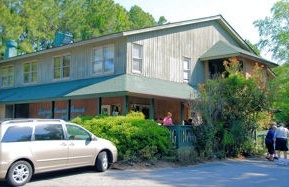 This unique Hilton Head restaurant was voted best bakery and cafe by Southern Living. Signe's Heaven Bound Bakery Cafe is off the beaten path, charming and cozy. We found Signes to be the most pleasant for Hilton Head dining experiences. Don't be fooled by its plain exterior. 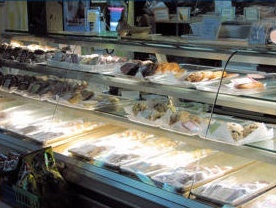 For over 34 years Signe's Bakery and Cafe has been a favorite among locals for Hilton Head Island restaurants. Signe's Bakery Cafe offers a casual relaxed atmosphere with baked goods, warm breakfasts and healthy sandwiches for lunch. Not many Hilton Head Island restaurants have that combination. Too, if you have a day at the beach planned be sure to check out Signe's beach bag which includes a sandwich, chips, fresh fruit or pasta, a beverage and a cookie all for $12. The Beach Bag is a great idea for the trip home as well. The key-Lime bread pudding is amazing. The best among Hilton Head Island restaurants! Signe's tasty brownies, cookies and melt-in-your mouth pound cakes are incredible. You can order from Signe's Bakery online and have baked goods shipped to your home. Don't get seated right away at this Hilton Head restaurant. You need to go to the front counter, place your order and tell them where you're sitting; they will bring out your drinks and food. Be sure to check out the art on the walls at Signe's. The original art is done by no other than Signe herself. 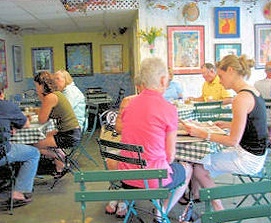 Most Hilton Head Island restaurants have character, but Signe's is very different. 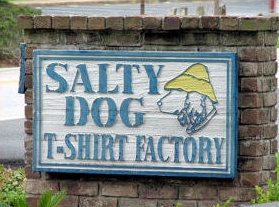 Practically next door is the Salty Dog T-shirt Factory store. No need to go all the way out to South Beach to get your Salty Dog t-shirt. And much like the original shop in Sea Pines the kids will love the parrots near the front door as well as the big fat cat! I hope you enjoy this unique Hilton Head dining experience like we have. There are so many Hilton Head Island restaurants; this one is worth a try.